I first tried porchetta at my mate Pete’s birthday. He cooked it long and slow, with the skin on. It was delicious but very difficult to slice as the skin turned to crackling, and we know how tough that can be on your teeth, and on a knife! Al’s recipe is twice cooked, firstly in a bath of apple juice and chicken stock. Then, after slicing, it’s fried in a really hot pan or on a barbecue. Preparing the pork belly requires the skill of a surgeon and a very sharp knife. Al’s assistant Hayden explained to me it’s like making a ‘pork blanket’ – the pork belly is sliced thinly through the middle so it doubles in size. It ends up being very thin so it will roll up many times over. I don’t usually list recipes for salads and accompaniments, but the grilled carrot and fennel seed salad is exquisite, and complements the pork so beautifully. It truly is a great combination. Lastly, let me say that Stoked is all about cooking on an open fire, or with smoke. The day that I prepared and cooked this meal it was pouring with rain so I was forced indoors. It worked fine roasting in an oven, and using a very heavy pan for the frying, and for the grilled carrot. You just need a very good extractor fan! Make your pork blanket by removing the skin, then carefully slicing through the belly horizontally so it doubles in size and looks like a ‘pork blanket’. Remove any large pieces of fat. 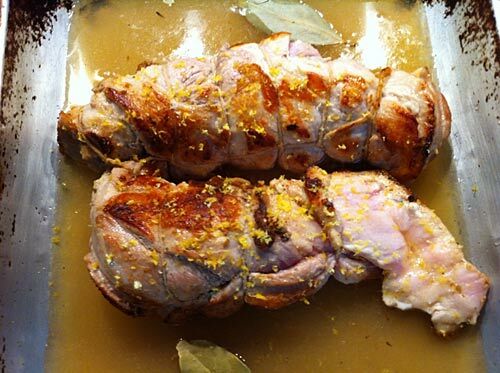 Sprinkle the garlic, fennel, lemon zest, and other herbs over the pork then roll tightly and tie at 3cm intervals – tightly. You’ll end up with a long parcel of rolled pork. Get a heavy fry pan and on a high heat sear the porchetta all over til golden brown. Place in a roasting dish. Pour the apple juice over the top, and add the chicken stock and bay leaves. At this stage I realised I had left out the lemon zest so I grated and sprinkled over the top of the pork. Cover the dish with tinfoil and return to the oven top to get the whole thing boiling. Once it’s bubbling put it in the oven and leave it there for two hours. I removed the tin foil half way through the cooking but it probably pays to leave it on for the whole time. Once cooked (soft and tender right through) take out of the oven and leave it to cool in the juices. You can then refrigerate and do the second part the next day. Heat a pan (or stove top or chargrill) as hot as you can get it. Place the carrots in a bowl and toss in olive oil to coat. Season with salt and pepper. Place the carrots in the pan and leave for 5 minutes before turning so they start to turn black-ish. Once caramelised all over remove from the heat and leave to cool. Add the remaining ingredients to the carrots and toss to combine. Check the seasoning and you are ready to go once the pork is ready. Remove the porchetta from the refrigerator and remove the string. Slice the pork into thick steaks. Get a heavy fry pan (maybe the same one that you did the carrots in) and have it medium hot. Lightly brush the porchetta with oil and season with salt and pepper. Cook until golden brown on each side, and warm all the way through. Serve immediately with the carrot salad. I had guests over for dinner and everyone was very impressed. It’s simple, and what’s more it’s fun to cook. Enjoy! to resolve my problem. Maybe that is you! Taking a look ahead to ook you. Wow! At last Igot a web site from where I be capable of actually obtain valuable facts regarding my study and knowledge.